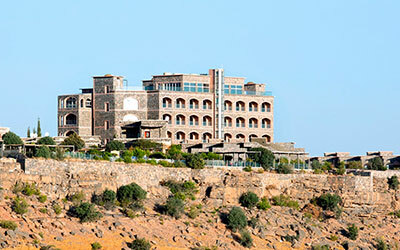 Situated on top of the Mountain called Jabal Akhdar meaning Green Mountains, one of the favorite tourist destination of Oman and for the Whole East Region. It is about 2500 meters from Sea level and one of the highest points in Whole of Middle East. The property consists of 65 elegantly designed rooms facing the Mountains, one restaurant with open patio, one banquet hall, outdoor pool right on the edge of the cliff, Kids area are surrounded by beautiful landscape offering Omani hospitality in a very passionate way.